Has your family been into exciting outdoor activities lately? Are you the type who goes out to have fun, rain or shine? If you are, it’s okay to go on as planned but be sure to take precautionary measures. Before you leave, next to your vehicle, check the weather condition and check the things you need to bring for everybody’s safety. The best option to guarantee security, address occurrence of emergencies or avoid possible dangers is to buy walkie talkies. They need not be expensive but they should be of high quality. Our Top 5 Walkie Talkies will prove to you that your family can own reliable radios without exhausting your savings. We arranged our Top 5 Walkie Talkies according to their affordability. Each of the items we included in the list brief description of what you can expect in terms of efficient, fast and clear communication. You can check the other similar best-performing products that are even more expensive to compare and discover that the ones in our list are just as excellent as the others. Read on and see which one can address your communication needs, including one walkie talkie with camera. If you have kids, the Cobra Walkie Talkie is a communication device for them. It is among the most affordable ones in the market at present that’s why this product’s considered a bestseller on Amazon. Say, your children love to participate in outdoor stuff like camping, hiking, boating and mountain climbing this device ensures your son’s or daughter’s safety. This also helps your families track the whereabouts of the other members of your households when outside for on some exciting activities. You need not worry about your children’s safety anymore while away from them especially that this walkie talkie reaches a wide range of up to 16 miles. Of course, that’s over a flat distance with minimal inference. As with any 2-way radio, expect that range to go down with buildings, dense trees, etc. Additionally, you can get alerts on the possible weather condition as this communication device can access 10 different weather channels. As a result, you cancan prepare for the coming storm or possible occurrence of emergencies. One of the unique features about the Cobra compared to other options is that it has an LED flashlight at the bottom of the unit. This is super handy should you need a bit of extra light on your trip. See: Full Review of the Cobra Walkie Talkie. 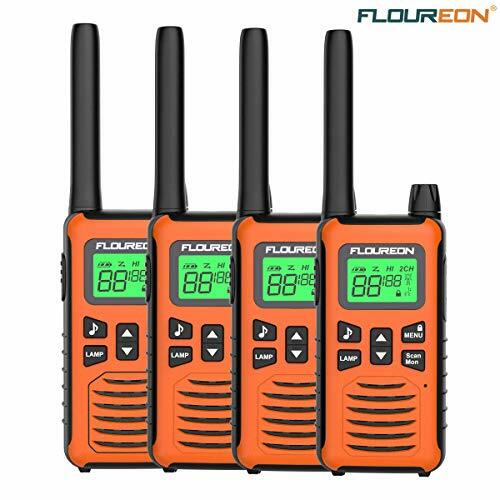 The Floureon 2 Way Radio is the best for your communication need. We highly recommended it to those with kids at home who love to go on outdoor activities. If you have kids at home, you will definitely love this device because all members will be in constant communication with one another especially when in an outdoor fun. Bike riding, skateboarding, mountain climbing or simple hide ‘n’ seek game are more fun when there are radios that make interactions smoother and more seamless all the time. This is one of the most affordable walkie talkies available in the market today. For a very reasonable price, this communication device features 22 channels and has up to two-mile range. Your child can depend on the Floureon 2 Way Radio in any time of trouble. Say your son gets lost out in the forest while hiking. He can clearly hear your instructions in finding his way back. And it’s compact enough to just carry in your backpack with you wherever you go. See: Full Review of the Floureon 2 Way Radio. 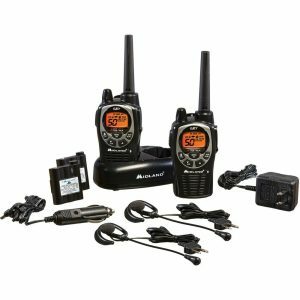 If you are going on an outdoor event a few weeks from now, this is the perfect time to purchase a walkie talkie set. Definitely, there are many things to do in preparation for this exciting activity with your loved ones. As you plan, don’t forget to include the weather update. Be sure to be in the know all the time so as not to spoil the fun moments especially that you’re spending most of them outdoors. If you wan to keep an ear on the weather when you’re out on and about, look no further than Midland. The NOAA weather scan is a feature unique to Midland 2-way radios among this list. It automatically scans through 10 weather channels and will alert via siren in case of severe weather updates. If you’re a boater, or out of the water for just about any reason, it may be exactly what you need! Have the Midland Radio for fast and efficient communication with your spouse and kids. Coming in two radio units in every pack, they will help you stay in touch with your family even if you separate ways while hiking, hunting or mountain-climbing. For such a low cost, this device guarantees to give you all the updates you need to make sure the weather is perfect on the day of your trip and the whole duration of the activity. This device features all-hazard and weather alert, as well as weather scan for your family’s safety outdoors. If you’re looking for a device that’s not going to die on you in the middle of your big day at the ski hill, you might want to consider these ones. The long-lasting battery will keep going, and going. And when it dies? Replace it with the rechargeable battery that’s included along with it. This will give the maximum possible time without charging the unit. If you’re looking to share some information of a private nature over the airwaves, then you’ll want to consider a walkie talkie with privacy codes. The Continuous Tone-Coded Squelch System (CTCSSS) has more than 2600 channel options so that you can block other conversations. You can also use silent operation to turn off this option. See: Full Review of the Midland Two-Way Radio. Our last but definitely not the last in the Top 5 Walkie Talkies is the Motorola Two-Way Radio. If you are setting a camp out or hiking with your friends or loved ones, this device is perfect for you. Be sure to equip yourself with all the must-haves to face every emergency you encounter along the road, out in the forest or anywhere outdoors. It’s probably the best long-range option out there! This powerful unit can cover quite a considerable distance, in a variety of situations, and it features the latest technology. I know many people who’ve worked in the film industry in Vancouver, Canada (I used to do it myself!). Radios are vital to set life, and basically nothing happens if the radios aren’t working. You can find one of the belt clip of just about all of us! That’s why Motorola is the go-to brand. They’re sturdy, the batteries last a long time, and most of all, they’re reliable. The long range is better than much of the competition. For the average person who wants to communicate with their family on a hike? It’s exactly what you need. The radio set is available in two radios that both guarantee clear and continual communication with your travel companion. 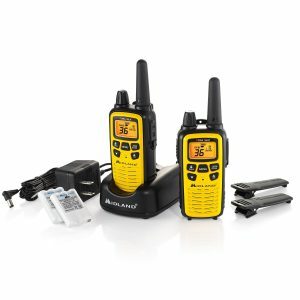 Even if you accidentally lose your mountaineering partner, you won’t have any worry with a radio unit with you. You don’t have be the techie type to operate the Motorola Two-Way Radio. Even if you hate complicated selections from the menu, this communication gadget is still for you. And for this very low price, you can already make sure of your satisfaction when communicating outdoors. Although very few electronic devices are full waterproof, this rugged set of walkie-talkies perhaps comes the closest. Do you best to protect it, but a little bit of mist or water shouldn’t hurt it. Just be sure to not fully submerge it (as with any walkie-talkie). Just be sure you have a full battery to ensure seamless communication all day. In connection to this, each unit boasts of long battery life. It doesn’t matter too, if the weather is not too friendly. The device has 11 different weather channels. We also love the mini-USB charger that comes along with it. In case you can’t charge the batteries in the stand, you can just plug the walkie-talkie directly into the USB charger for added convenience. See: Full Review of the Motorola Two-Way Radio. Is it the best one for adults? Most likely yes! If you’re looking for a walkie talkie with camera, then look no further than this Spy Gear Walkie Talkie Set. It’s designed for kids and it’s one of the best toys of the year. If your kids love electronics, they’re going to love this. Your kids will love using it for their next spy mission! Some radios have a 36-mile range, or even further! Some cheap ones and the ones designed for kids can span a much shorter distance. Consider what situation you’ll be using it for, and then buy accordingly. The thing to keep in mind is that interference is a real thing. The more trees, walls, mountains, or building between devices, the less of a range you’ll have. The ability to switch channels to avoid interference can be really useful. Also useful is when you have different teams like on a construction site or film set who may each want their own channel. That said, unless you’re a pro, you may only need 4-5 channels at max. Some walkie talkies run on AAA or AA batteries, while others plug into the wall to charge. Consider your needs (in the wilderness for days), or on a construction site for example to decide what’s best for you. You’ll also want to consider battery life. If you don’t have access to power such as on a boat or wilderness expedition, you’ll want the longest battery length possible. Some are waterproof and can be used in the rain, or when boating, etc. Some of them even float if you drop them. Some of the high-end options offer access to NOAA and local weather forecasts so you can get alerts in case of bad weather. Boaters will love this feature. If you pick up a few different radios, you’ll notice that some are very lightweight while others are more sturdy and weigh quite a bit more. If you’re using it for traveling, opt for a lighter one. If you’re going to use a radio on a construction site, you’ll want one of the toughest ones money can buy. They’ll get dropped and bang into stuff all the time. On the other hand, if it’s for an event organizer, you can get away with some of the cheaper ones that are not as durable. Some come with a display that lights up at night, which can be very handy if you plan to use them in the dark. A set of higher-end 2-way radios certainly aren’t cheap! You should look for ones that offer, at minimum a 1-year warranty on their products. If you’re using it for something like on a movie set, you’ll want the highest quality sound possible. Similarly, if it’s for emergency purposes, you’ll want one with clear, crisp sound. On the other hand, if it’s for your family at the beach, it may be fine to opt for one of the lower-end models that are a lot cheaper. These two radio services allow you to use the walkie talkie right out of the box, without having to go through any legal hoops to use it. FRS stands for family radio service and FCC stands for Federal Communications Commission. Have your Say about the Best 2-Way Radios! 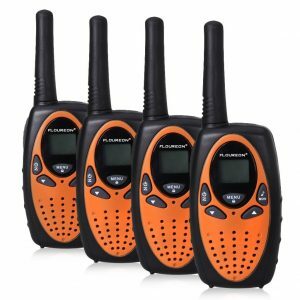 Which of these Top 5 Walkie Talkies are you considering for your company or family? Leave a comment below and let us know your thoughts.